State Bank of India (SBI) has declared SBI PO Final Result 2017. 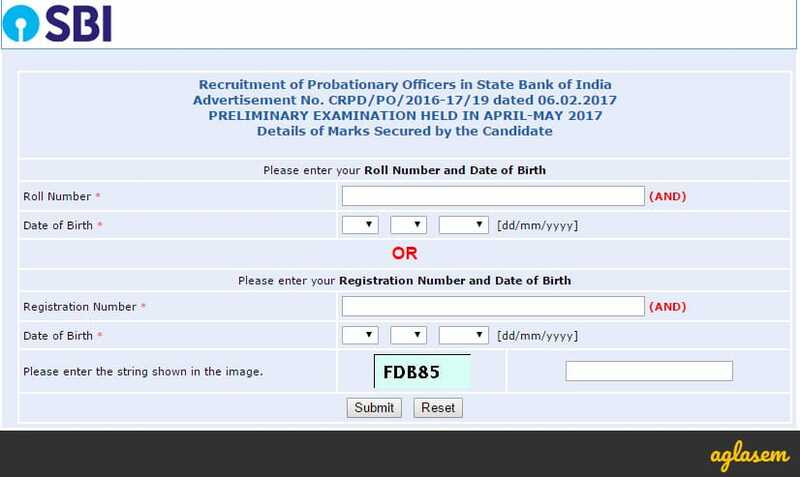 The result of SBI Probationary Officer 2017 Final has been published on October 24, 2017. The candidates who cleared the interview and group discussion have been included in SBI PO 2017 Final Result, which has been announced through a PDF. SBI PO 2017 Result is announced at sbi.co.in. Check your SBI PO Result 2017, sectional and overall cutoff and more details from this page. Latest: The call letter for successful candidates for SBI PO 2017. Candidates can check it from the link given below. Call letter: Click here for the Call letter for the successful candidates. Check SBI PO Pre Result 2017: Click here to check SBI PO 2017 Preliminary Result. The Final Result of SBI PO 2017 has been announced on October 24, 2017. It announced after the assessment of candidate’s performance in the Group Discussion and Personal Interview round. It also is announced as the Main result, in a PDF format. Check your name in the result PDF. The Final Marks of SBI PO 2017 has been declared. It announced after the assessment of candidate’s performance in the main exam, Group Discussion and Personal Interview round. The window will appear like the image given below. State Bank of India (SBI) has released the online SBI PO mains examination result 2017, which was held on 04th June 2017. Candidates can check their results here through the direct link provided below. Result of SBI PO Main 2017 is a PDF file. All you need to do to check SBI PO Main Result 2017 is to open PDF file and view it. The Main examination consists of two sections, objective and descriptive. The objective section was of 200 marks, whereas, the total marks for the descriptive sections were 50. 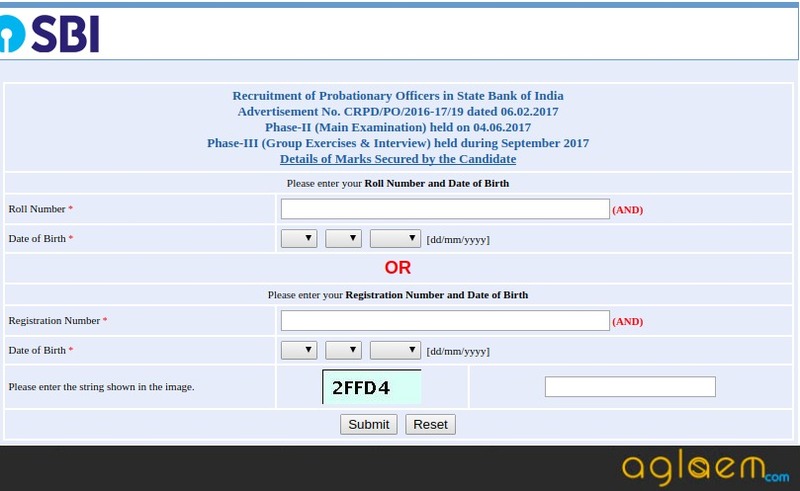 The candidates will be able to check their SBI PO Main Result, by following the steps mentioned below. The descriptive paper of the candidates would only have been checked if they qualify the Objective Type paper. Cutoff for SBI PO Main 2017 will be announced with the score, which will be announced soon. The last year’s SBI PO cutoff of last year. Result of SBI PO Preliminary 2017 has been announced on May 16, 2017. The preliminary examination of SBI PO 2017 was held in April. Result of the examination was announced in May. The result was announced on the official website and candidates could check it by accessing the login. 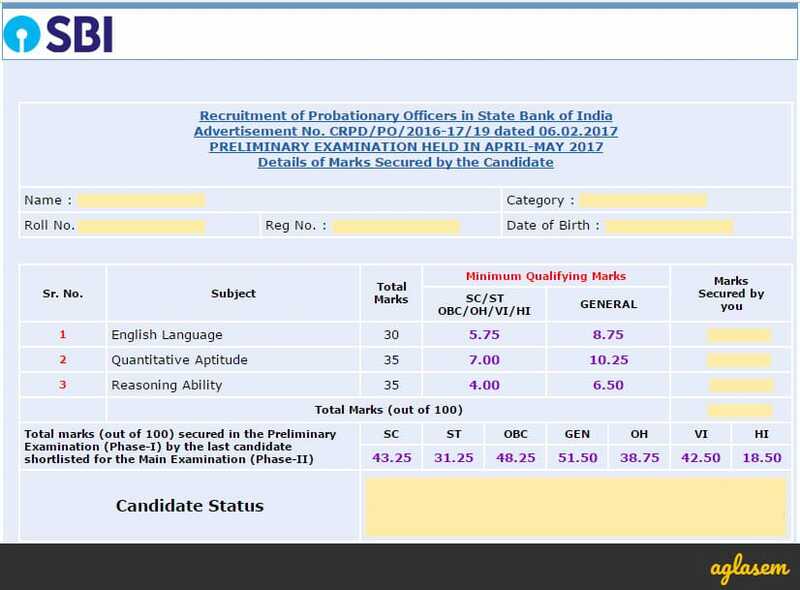 SBI PO Result shows marks, cut off, and qualification status. The candidates who qualified in the examination were called to appear for the SBI Main 2017 exam. The cutoff SBI PO Prelims exam for 2017 and previous years is as below. Congratulation to all the candidates who have qualified the examination. Now that the result is out, stress to clear the Interview round will propound. Well, worry not. These tips below will help you in cracking the PO Interview will flying colours. #Tip-1 – Stay Confident: The key to success is confidence. You have come this far, now nothing can stop you from reaching the pinnacle of success. #Tip-2 – Read About Banking, Economy, and Currency: If choose, the candidates will ultimately work in the banking sector, which is a concern of Economy and is dedicated to currency. Start reading about it and above that start noticing. Have you noticed that in some new Rs. 500 note the RBI Line is near the Governor’s Signature, while in some it is far to the side of Bapu. Not notice yet? Well do it now. Apart from this, do keep track of the current events as well. #Tip-3- Expand Your Area of Internet: Reading books and newspaper is a good idea but reading it in variety is better. If you were reading TOI, The Hindu, etc till date then now it is time to move over to The Economic Times, Financial Express etc. #Tip-4- Know Your Self: In the interview round, the panel will try and judge you on the basis of various factors. If you know yourself, as in your likes/dislikes, hobbies, strong area of study, etc then no body will be able to stop you. Know yourself and then work on your knowledge, personality, communicating skills, etc. Preparing is only one side of the coin. Appearing for the examination is what changes the entire game. These tips below will help you perform better in real time scenario. #Tip-1- Breaking the Ice is a Myth: It is considered that the one who starts the discussion in GD round gain extra point and more attention. Instead of speaking for the sake of breaking the ice, it is better to take you time and evaluate your opponents. This way, you will be able to identify the one whom you can surpass and also put your thoughts in clear and organized fashion. #Tip-2-Go for Refute: When you will listen, you will be able to refute better. It is always advised to refute because it send out impression that you are a good listener and person with perspective. #Tip-3-Know the Selection Mechanism: A lot of candidates simply prepare for the interview and GD but they do not understand the selection procedure. Hence, are not able to cope up, if moving downward. So, GD/PI will be of 50 marks. Out of these 50, 20 marks will be allocated for GD, whereas, the remaining 30 marks will be for the Personal Interview. So, do not lack confidence if either of the round don’t go well. Try and cope up in next round of. If you have any queries regarding SBI PO Result 2017, please ask in comments below.